Populating lakes and slack waters in every US State (except Alaska, Arizona, and New Mexico), and spreading throughout every Canadian province except the furthest reaches of Nunavut and the Yukon, the Hex Mayfly (or genus Hexagenia) is one of the largest and most prolific mayfly species found in trout waters. Emerging from the muddy bottoms of lakes and rivers at twilight in early to mid July, it is not uncommon for the hatches of these large mayflies to show up on radar as their numbers are so great! For anglers living among waters that the Hex call home, this is one hatch worth putting your job on the line to skip work for and fish! The Small Selection includes a total of 12 Hex Mayfly patterns and includes 4 wet and 8 dry patterns. The Large Selection includes a total of 24 Hex Mayfly patterns ensures that you're ready to do battle with trout on the river during this epic hatch! 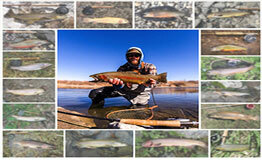 This selection includes 8 wet and 16 dry flies.